This went out as an update to our amazing backers a couple of days ago, but we thought we’d share it with everyone because we’re just so darn excited about this game! We thought it was about time we shared a bit more information about Fortress of Fire, the second title in our Order of the Thorne anthology series. 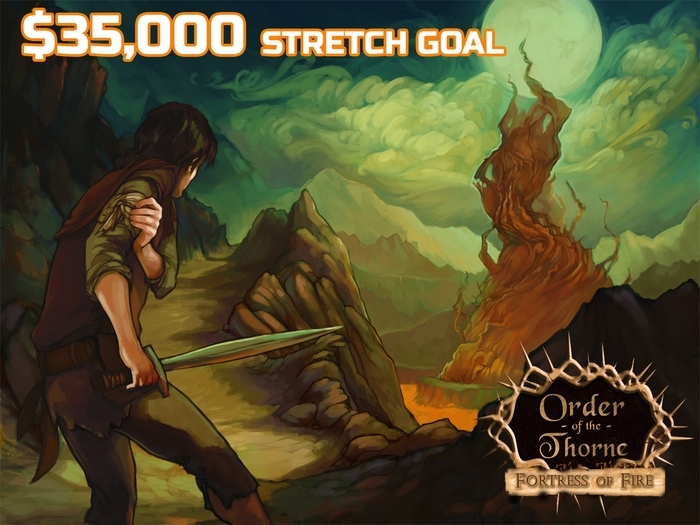 With a week to go before our Kickstarter campaign finishes, Fortress of Fire is getting close to being funded! Nostalgia … what’s it done for us lately? I was thinking about nostalgia for computer games today. Adventure games specifically. It’s not a stretch really because with our first game (Quest for Infamy – in case you missed it!) 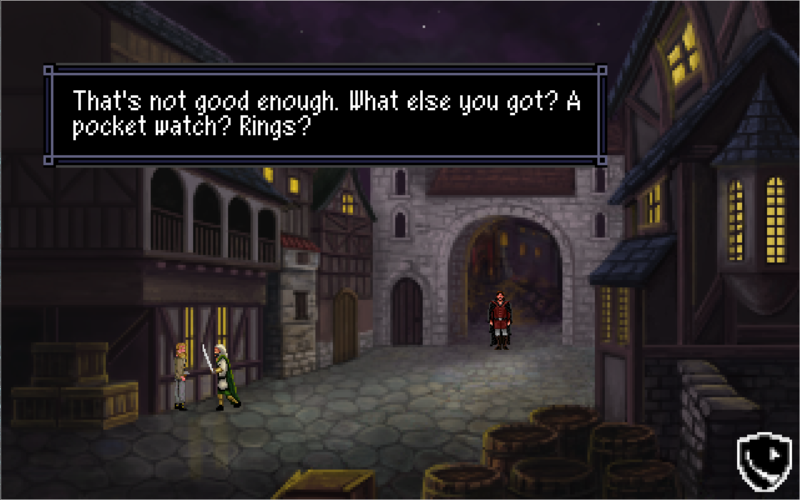 it was driven largely by that nostalgic feeling for adventure / RPG hybrid games. There’s a million (or maybe less) references in the game to those games of the “golden era”. Heck I wrote a chunk of them myself! I’m pretty sure there’s at least 3 references to a golden ring in a birds nest. And there’s something just great and satisfying about another person getting that reference and laughing at it too. But where is that line between nods to the past and living in the past? I want to play a new game like Quest for Glory EGA but should it be a DOS game in 16 colours with vector drawing? Is that the extreme of nostalgia? To make new games that won’t even run on a modern system without emulation? Or should we look at the past and see what was great about it? Should we take those elements that worked, like a great fairy tale story, and use modern tools to tell it? It’s possible to get so focused on making a game that brings back all those longingly remembered feelings from yesteryear that you can forget that computer games, players and the world at large has change one heck of a lot since then. And what worked then may not work now. Would any significant number of players today be satisfied with a command input (parser) style interface in a game? I would suggest the answer is no. Personally I love it, but I don’t think I’d make a game using it. Or what about using the save function to progress in the game? It was standard in classic games but it screams bad design today. Those two things though do invoke memories of playing Space Quest I with my dad and brothers and working our way through the game. Nostalgia. We live in a time now where it’s possible for a group of people to make games without ever sitting in the same room. Where we have the choice in style and content that simply wasn’t possible at Sierra or LucasArts in the early 90’s. So the trick is to select the good things that worked but not to be limited by those limitations that those designers were limited by. We don’t have to worry about disk space (mostly). We’re not limited to a 256 colour pallet. Or vector based graphics. Or PC speaker beeps and boops. But our games are modern games. Under the hood is a modern engine fully compatible with Windows, Mac, Linux, Android and iOS. The sound isn’t limited to old midi forms, the graphics can be 24-bit in any size resolution. The voice pack can be as big as we want because we’re not limited to space. So while we make games that have that distinctive look made popular in the 80’s and 90’s, they’re not old fashioned in any other way. There’s no difference between that as a choice and a movie producer like Steven Spielburg using black and white to tell Schindler’s List. So that’s my thoughts on adventure games today. Lets not live in the past, but look back and remember it fondly. It was awesome after all. Making games and playing games are poles apart, I’m sorry to say. And there’s two roles I take at Infamous Quests. One is the creative side. I create games, whether it be design or programming or the occasional piece of artwork. The other side is the business side and that’s the side that takes most of my working day.